Welcome to our adventures on board Carra. We are currently enjoying rock hopping in the Baltic. 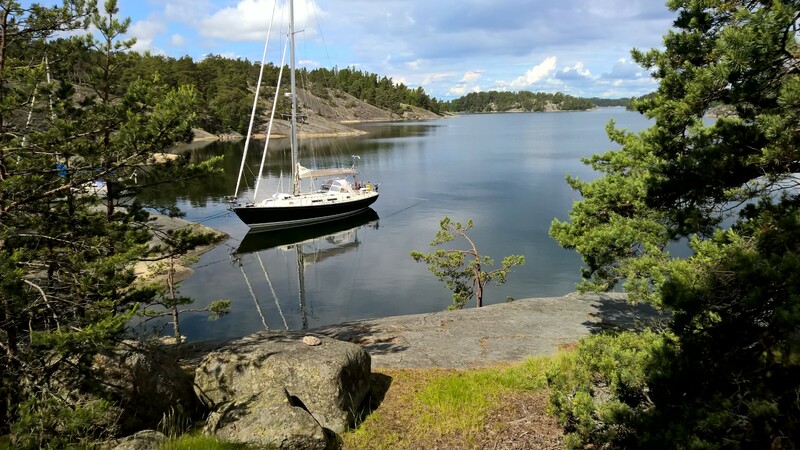 We keep Carra just north of Stockholm and our current cruising ground is the beautiful Stockholm Archipelago. Not only is the scenery stunning but you are spoilt for choice as to where to overnight as it made up of 30,000 Islands. So you never have to visit the same spot twice – unless you want to. Just 2 hours away is the start of the Aland Islands and the Turku Archipelago which has some 70,000 islands. They say that Finland has 50% of the worlds navigation marks, Sweden 40% and the rest of the world 10%. Having sailed in both I can really believe it. You soon get used to sailing close to rocks though it does help that there are no tides however the water level does change. But parking your pride and joy centimetres from solid granite without your heart being in your mouth is not something we have got use to yet. In 2006 we sailed round Britain in our last boat Ituna a Rival 38 and I then wrote a book “UK and Ireland Circumnavigators Guide”. I have combined the website that I previously maintained about doing a UK Circumnavigation into this site – so you will find tips on planning a trip around Britain but they are equally valid for extended sailing. Love to read this. Thank you for including me.